NAIROBI (Reuters) - Kenya Electricity Generating Co (KenGen) is seeking bids for the design and construction of two geothermal power plants with capacity totalling 210 megawatts (MW). The plants will be built in the steam-filled Olkaria field, state-owned KenGen said on Tuesday. Endowed with vast geothermal energy resources in the Rift Valley region, the east African nation wants to expand its generation capacity by 5,000 MW by 2017 from about 1,664 MW now, aiming to lower tariffs and cut the cost of doing business. By 2030, Kenya estimates it will need some 15,000 MW of extra capacity, with much coming from geothermal and other renewables which will be both cheaper than widely-used diesel generators and more reliable than its hydropower dams. KenGen said one of the projects will involve the construction of a 140 MW Olkaria V power plant and another 70 MW plant in Olkaria I unit 6. The company, which is 70 percent state-owned, said it was in talks with development institutions to borrow money for the 140 MW plant, which it planned to build first. 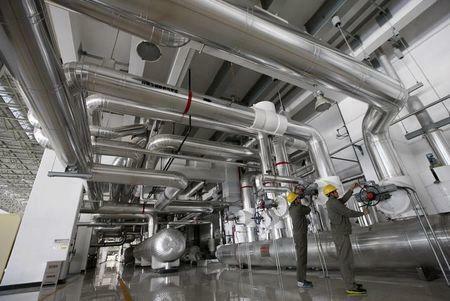 Kenya is the first African country to tap geothermal power. It has potential to produce 7,000 MW and is targeting production of at least 5,000 MW of geothermal power by 2030. Development of cheaper geothermal energy also means the country has to rely less on thermal power that is prone to the vagaries of international prices. In Kenya, an extra fuel charge or premium is added to normal power rates depending on the amount of diesel generation used and on global fuel costs.